Of ambivalent appearance, Canyon shows a surprising contrast between its strictly geometric outer sides and rough, irregular inner surfaces. Castagna’s piece exhibits a disconcerting fracture ripping matter apart and exposing an organic-looking substance inside (flesh?). The entire piece is organised around this alluring “wound” of disturbing appeal — while arousing our curiosity to look and even touch, it also makes us recoil in disgust and revulsion. Not even absent-minded passersby can remain unaffected by this abyssal wound. 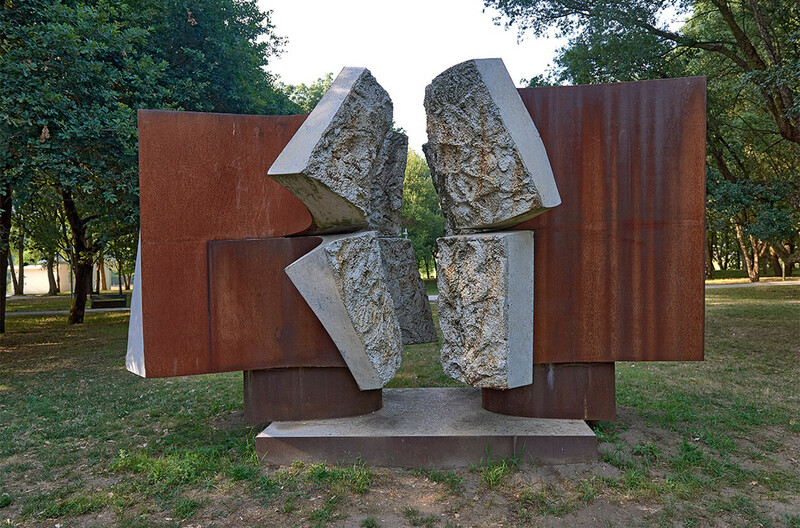 Pino Castagna’s work has been characterised by constant experimentation with new techniques and materials as diverse as ceramics, aluminium, stone, wood, concrete, strings or tree branches. Each of these offers a new and original expressive possibility, which the artist explores by testing the materials’ plastic potential and pushing their endurance limits. In addition to his practice as sculptor, Castagna’s oeuvre encompasses painting and design, as well as public art, in which the architectural and environmental vocation of his work is fully revealed.